Mohammad Khatami, in a photo from October, said Sunday he is running for Iran's presidency. A familiar face is back on the Iranian political scene. Former President Mohammad Khatami, once the darling of reformists, has announced that he will run for president in June elections against incumbent Mahmoud Ahmadinejad, who reversed many of the freedoms Khatami had allowed during his two-term rule. The announcement by Khatami has stirred up politics in Iran, where many see the former reformist leader as having a real chance of winning against conservative hardliner Ahmadinejad. “The Iranian nation’s historical demand is to have freedom, independence and justice, and I will work for that,” Mr. Khatami said at the Sunday press conference in Tehran when he announced his candidacy. The race will now be polarized between two competing visions for Iran’s future: Khatami’s more open and liberal Islamic state with personal freedoms and closer ties with the West, and Ahmadinejad’s conservative rule that has seen great animosity with the United States and tighter restrictions on social and political freedoms. Khatami is believed to be able to rally voters fed up with Ahmadinejad’s rule. Since his election in 2005, Iran has seen a steep deterioration of the economy, rising unemployment and tighter sanctions from the West. Still, Ahmadinejad’s unexpected rise to power came from the strong support he received in villages outside Tehran and his backing from Iran’s supreme religious leader, Ayatollah Ali Khamenei and the all-powerful Guardian Council. He can still count on the support of the country’s poor and the religious leadership. In a televised address on Tuesday to mark the 30th anniversary of the 1979 Islamic Revolution, which led to the end of close relations between Tehran and Washington, Ahmadinejad said that Iran was ready for new dialogue with the U.S. “Our nation is ready to hold talks based on mutual respect and in a fair atmosphere,” he said. Still, after eight years as president from 1997-2005, Khatami knows the intense challenges of the office. Stymied by the hard-line clerics, Khatami accomplished little of his reformist agenda. He witnessed the closure of many pro-democracy publications, the jailing of activists and the elimination of reformist allies from parliament. Worse, many who had voted for him grew disillusioned with his rule, saying he did not stand up to the Guardian Council. Some analysts have said that their disillusionment, which led many to boycott the 2005 elections, contributed to Ahmadinejad’s surprise win. 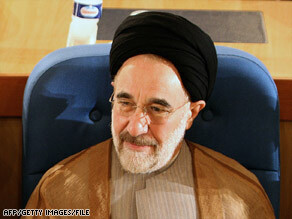 Even if Khatami can rally the votes to win in June, his presidency will be an uphill battle. The office of the president is a largely symbolic office in Iran, where unelected bodies and the Supreme Leader hold the real power. I foresee the news "Khatami dead in car bomb" because psychopath Ahmadinajihad is not going to stop being the Ayatollah's puppet. I suspect Ahmadinajihad is one of those orphan boys who are brought in the brainwashing Iranian School of Hate-USATAN – probably since he was 2 yrs old. Ahmadinajihad's adoptive father his puppeteer the Ayatollah has a very visible indentation in his frontal lobe, a possible sign of lack of empathy due to damage in that area, so what do you get when you mix a sociopath with a psychopath? I've thought for a long time that the majority of Iranians are not happy with the fascist regime that took over their country after the revolution–especially the young people. It would be better for them and us if they could somehow change it. I think such changes can only come from within a society. They take a long time, especially in nations with no democratic traditions. It would appear that Iran is exploring putting on a new face-–will the people of Iran be brave enough to change its image-–time will tell.